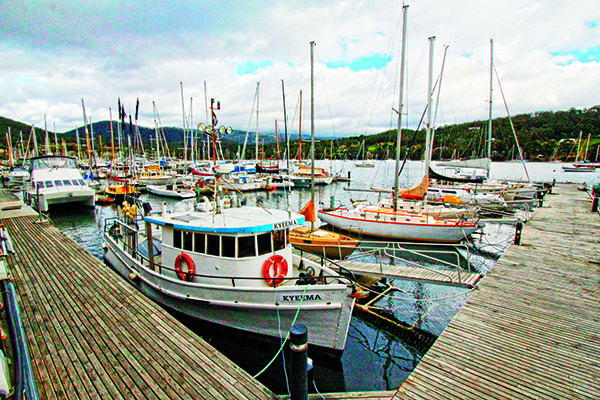 The Mirambeena had just departed the small fishing town of Kettering, 40km south of Hobart, to begin the 20-minute crossing of the D’Entrecasteaux Channel to Bruny Island, Tas. Waves slapped against the starboard hull and threw occasional flurries of spray on board. Behind me, the deck was jam-packed in tight, orderly rows of vehicles of all kinds, some of them, like ours, towing caravans or camper trailers. It’s a spectacular introduction to one of Tasmania’s premier tourist destinations, rich in history, spectacular scenery and gourmet food. 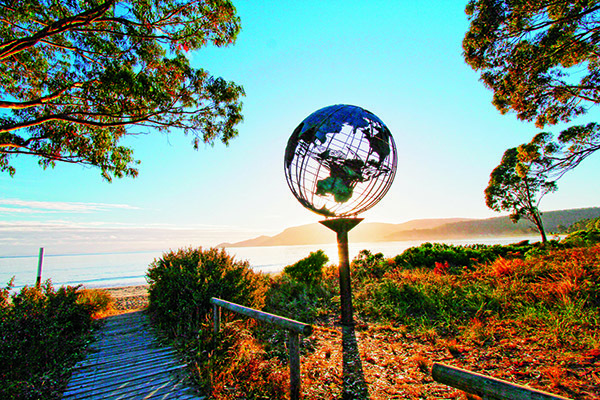 Bruny Island is actually two landmasses - North Bruny and South Bruny - joined by a long, narrow isthmus called The Neck. The islands’ combined length is only about 100km, but the landscape changes dramatically from sheltered sandy beaches and farmlands in the north, to tall forests, open bays and dramatic sea cliffs in the south. Don’t be fooled into thinking you can see and do everything in a day; get the most out of your ferry fare and stay a few days. There are plenty of places to stay, ranging from friendly campsites to luxury beachfront retreats. The indigenous Nuenonne people called the island ‘Lunnawanna-alonnah’ and two settlements on the south island still bear these names. Europeans settled Bruny Island in 1818 and a few years later a shore-based whaling station started up. Bruny is a great place for touring. Most of the roads are easy 2WD standard, suitable for towing and cycling. But there are many unsealed sections and some are slippery unsealed forest tracks more suited to offroad vehicles. Some rental companies are happy for you to take their vehicle across to Bruny Island, others expressly forbid it, with penalties for breaching the rental agreement. Make sure you read the fine print. Bruny is renowned as a foodie’s paradise and within minutes of disembarking at Roberts Point on the north island we spied BISH (Bruny Island Smokehouse). We pulled in for a tasting of their wares at the terrific restaurant and bar (serving locally distilled whiskey) with great views over Sykes Cove. Our first stop was the former Quarantine Station on secluded Barnes Bay, established as a maritime quarantine station in 1884 as a defence against infectious diseases among boat passengers. After its acquisition by the Commonwealth government in the early days of Federation, the facility was used for the internment of German nationals at the beginning of Word War I, the quarantine of immigrants during the influenza pandemic of 1919 and plant quarantine for 30 years to 1986. The unsealed coast road continued north through the holiday villages of Killora and Dennes Point, then looped southward with elevated, panoramic views across Bull Bay to the ‘Iron Pot’, the first lighthouse built in Tasmania and the second oldest in Australia. The main road snaked down the north island through open pastures and light bushland to Great Bay. At the Bruny Island Cheese Company we sampled some memorable cheeses of various vintages from goat, sheep and cow milk. Just down the road we stopped for lunch at the Get Shucked Oyster Farm. We have had oysters of right across Australia and, without doubt, these are among the best. A short distance further south, the main road crossed The Neck, a narrow ridge of sand separating Isthmus Bay to the west and magnificent Adventure Bay to the east. Before the construction of this road in 1950, the south island was accessed by driving along Neck Beach at low tide. We climbed a long wooden staircase to the Truganini Lookout, which has a spectacular 360° panorama of the coastline. visitors to observe short-tailed shearwaters and fairy penguins in their rookeries among the dunes. During peak viewing times in the warmer months (September-February), a park ranger attends a dusk information tour. We turned off at Lutregala Rd to inspect The Neck Campground, one of several free camps on Bruny. Facilities were basic (rainwater tank, toilet and picnic tables) but the location was superb, with flat, shady sites accommodating caravans, tents and trailers among the forest behind the deserted beach. We set up camp at the picturesque Captain Cook Caravan Park and it proved a handy base from which to explore the southern region. In contrast to the north, South Bruny’s hills are heavily timbered, with large pockets of rainforest and several state forest reserves that collectively blanket most of the island. The relatively sheltered channel side of the island is popular for fishing and recreational boating, whereas the exposed eastern side is extremely rugged, with dolerite cliffs towering 200 metres above the Tasman Sea. 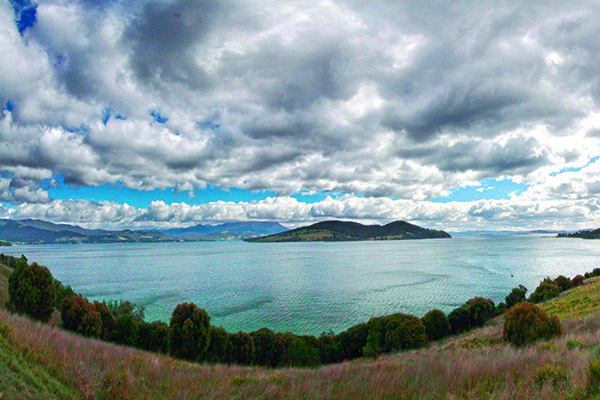 The South Bruny National Park encompasses the entire coastline and some of the hinterland between Fluted Cape and the southern part of Great Taylors Bay. Park passes must be purchased when entering the national parks. It took us the best part of two days to explore most of this spectacular island, by road, foot and boat. Our 130km road trip departed Adventure Bay along Lockleys Road and Staffords Road, through the lush, forested hills of the Mount Midway Forest Reserve to Whalebone Point on Cloudy Bay. Just before the end of the road, a side track led to The Pines camping area within a small enclave of the national park. The facilities here are limited to toilets and fireplaces, but the tent and trailer sites dotted around the clearing are sheltered from the gales that frequently roar in off the Southern Ocean. Prices Lookout overlooks Cloudy Beach, where a strong onshore wind drove a relentless barrage of waves onto the beach, clearly living up to its reputation as one of the most dynamic surfing spots in Tasmania. At the far end of the beach, accessed by 4WD along 3km of sand, free camping is available at the Cloudy Bay Corner Beach Campground. A company known as Camping at Bruny Island operates a privately owned eco-camping ground nearby, offering tent and camper trailer sites in a beautiful forest with access to a private beach. Retracing our route up Cloudy Bay Road took us through the township of Lunawanna and down the unsealed road to the Cape Bruny Lighthouse at the island’s south-west tip. Constructed in 1838, this iconic lighthouse was Tasmania’s third lighthouse and Australia’s fourth and it is the oldest existing lighthouse under Commonwealth control. The light station is open for inspection daily and the former residence is available to hire as holiday accommodation. Further along the adjacent Labillardiere Peninsula lies the beautiful Jetty Beach and another free camping area suitable for vans, tents and trailers with direct access to Great Taylors Bay for boats. The campground is also the starting point for a demanding six-hour circuit walk around the peninsula. Tracking north again to Daniels Bay, we made a quick detour to Bruny Island Premier Wines, Australia’s most southerly vineyard, before picking up the Coolangatta Road back to Adventure Bay. This 9km track traverses rainforest scenery in the Mount Mangana Forest Reserve and provides access to a walking trail to the island’s highest peak (571m). Back at the bay, we capped off the day with a two and a half-hour hike through coastal forests to the sea cliffs at Fluted Cape for an albatross-eye view of this dramatic coastline. On our last day on Bruny, we treated ourselves to one of the most awe-inspiring eco-adventures in Australia – a fast boat ride along the island’s south-east coast with Bruny Island Cruises. Passengers are kitted up in hooded, knee-length spray jackets and ushered to their seats in a 12.5-metre Naiad ‘yellow boat’. 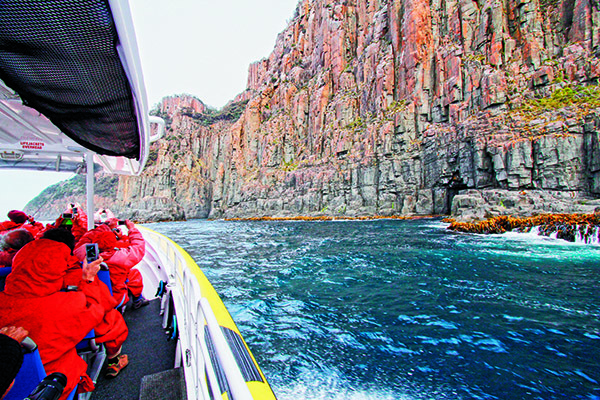 Departing from the jetty in Adventure Bay, this half-day ‘cruise’ gets up close and personal with soaring 272-metre sea cliffs and plenty of the native inhabitants. It was fun, fascinating and unforgettable. If you do nothing else in Tasmania, you must do this. Without gilding the lily, Bruny Island has it all. So, hitch up the van, jump on the ferry and be prepared for the most complete island getaway you’ll find anywhere in Australia. TT-Line Pty Ltd operates a ferry service with Spirit of Tasmania between Melbourne and Devonport, crossing both day and night, with on-board meals, accommodation and entertainment. The ferry is able to transport cars, motorhomes, camper trailers and caravans. Bruny Island lies just off Tasmania’s south-east coast and is accessed by a 20-minute crossing of the D'Entrecasteaux Channel on the Mirambeenaferry from Kettering, 40 km south of Hobart. Bookings are not required. There are no buses on Bruny Island so you’ll need your own transport to get around. Most roads are 2WD standard but there are many narrow, winding unsealed sections on which care should be taken. Park passes required when entering national parks. The full article appears in Caravan World #556 October 2016. Subscribe today for the latest caravan reviews and news every month!